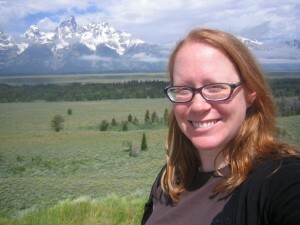 This week’s BEACON Researchers at Work post is by BEACON Managing Director Danielle Whittaker. The sense of smell is one we often take for granted in our own lives. However, even though we may not be conscious of it, odor can tell us a lot about a person, like how closely related they are to us, or how healthy they are – or how attractive we find them. Many mammals rely heavily on smell to communicate and have the anatomy to prove it: a wet nose, a large olfactory bulb in the brain, a vomeronasal organ, and lots of different scent glands. 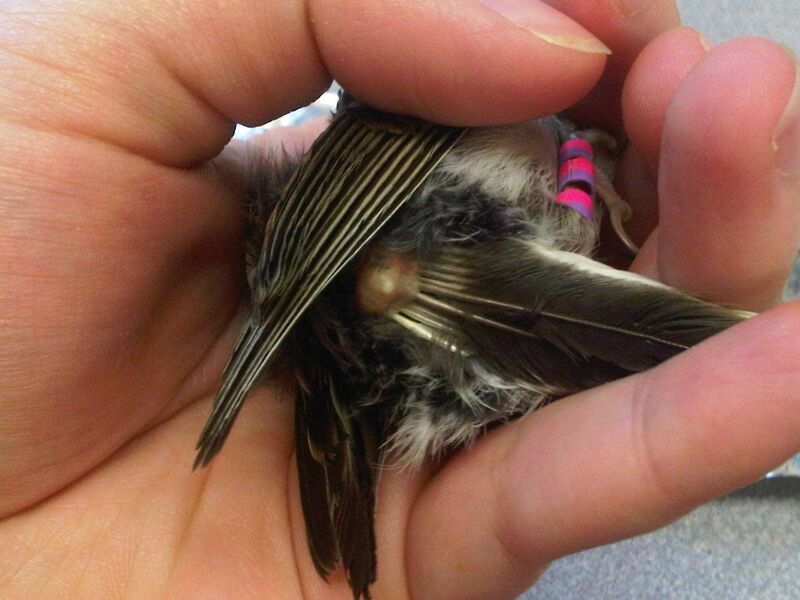 Birds, on the other hand, have a very small olfactory bulb, no vomeronasal organ, and no dedicated scent glands. For a long time people have thought that birds had little to no sense of smell. However, a growing body of research is demonstrating that birds can detect many different kinds of odors, that they produce odors themselves, and that those odors may affect their behavior. Dark-eyed junco, pink-sided subspecies. Photo by Marine Drouilly. I study the dark-eyed junco (Junco hyemalis), a small North American sparrow that is commonly found in backyards, especially in the winter. Juncos breed at high elevations and high latitudes, which means I get to do my fieldwork in beautiful mountain locations like Grand Teton National Park. I started working with juncos when I joined Dr. Ellen Ketterson’s lab at Indiana University as a postdoc in 2006, and still work with them today. 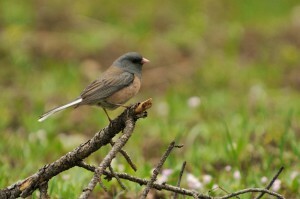 Like most birds, juncos have only one large sebaceous gland – the uropygial or preen gland, located just above the base of the tail. This gland produces an oil that birds spread over their feathers while preening, which helps protect the feathers from exposure to the environment and parasites, and also helps waterproof the feathers and keep the bird warm. Preen oil contains volatile compounds (like perfume!) that give the bird an odor. In collaboration with Dr. Milos Novotny and Dr. Helena Soini at the Institute for Pheromone Research at IU, I’ve been decoding the information contained in these volatile compounds. Different bird species have different compounds. For example, juncos typically have about 19 different volatile compounds in their preen oil, including several linear alcohols, methyl ketones, and carboxylic acids. Within a species, individuals vary in the relative proportion of each of these compounds. 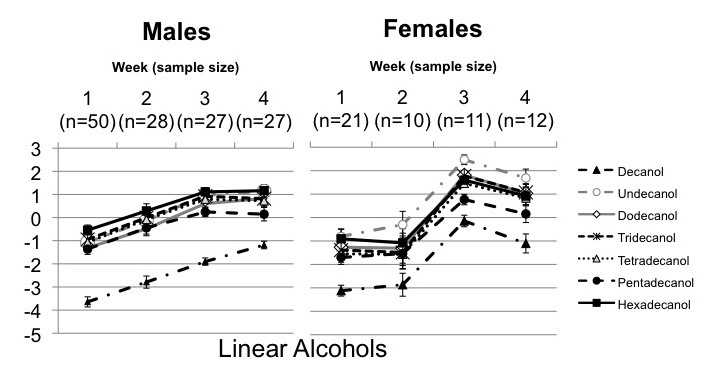 In juncos, males have higher proportions of the methyl ketones tridecanone and pentadecanone, while females have higher proportions of the linear alcohol undecanol. Like most temperate bird species, juncos are seasonal breeders. In the winter, they produce very small amounts of these compounds, and the amounts go up dramatically during the summer breeding season. Does this change have something to do with mating behavior? In my newest paper, I was interested in the hormonal mechanisms responsible for this seasonal change. At Dr. Ketterson’s long-term study site at Mountain Lake Biological Station, I captured male and female juncos during the first four weeks of the breeding season – a time when the birds are undergoing many physiological changes as they shift into breeding condition. As I expected, male juncos showed a steady increase in volatile compound concentration over the first four weeks of the breeding season. 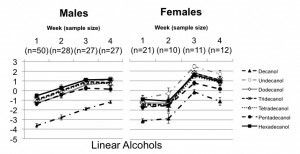 Females, however, showed a huge increase over the first three weeks, followed by a drop in the fourth week. What caused the drop? I looked closely at breeding data for the population that year, and found that the peak in female volatile compounds corresponded with a peak in egg-laying. I think that females may be using a strong odor to tell males that it’s time to mate. What does bird odor have to do with evolution in action? Animals use a variety of signals to attract mates: visual, acoustic, and olfactory. When populations diverge, we often see a corresponding shift in these signals that help reinforce the isolation of the two populations by preventing mating with each other, and over time these populations can become different species. In southern California, a small population of juncos colonized the University of California San Diego college campus beginning around 1980, and over just 30 years has rapidly changed compared to their parent population in the nearby Laguna Mountains. The UCSD birds are now smaller and less aggressive, they no longer migrate, and they invest more effort in caring for offspring than the Laguna Mountain population. They look different, too – males have smaller amounts of white in their tail feathers, a trait that is attractive to female juncos. 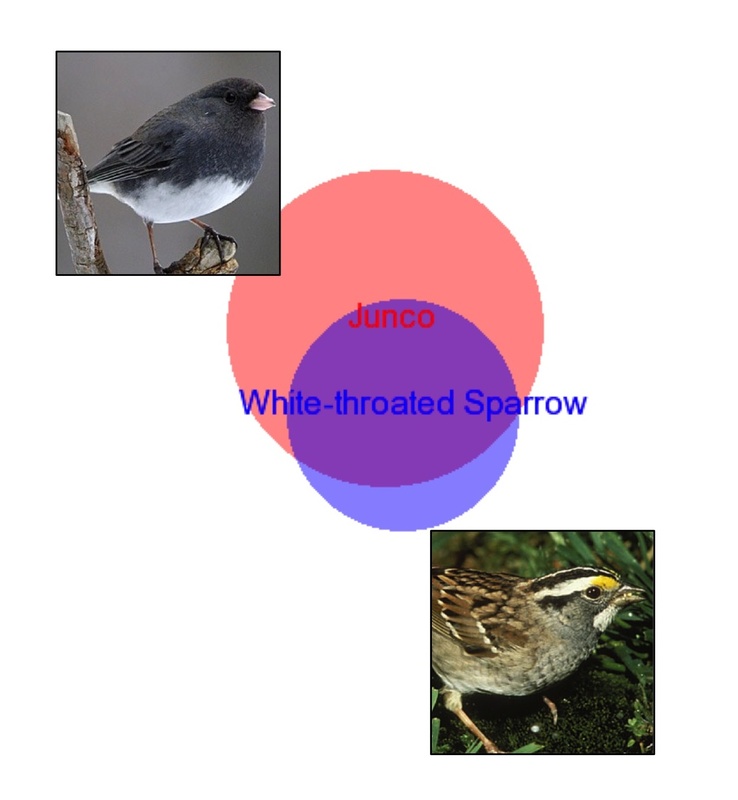 In collaboration with IU postdoc Jonathan Atwell, I found that they also smell different – male UCSD juncos have a more “female-like” odor than male Laguna Mountain juncos. I’m interested in how these different modes of signaling work together to communicate individual quality and identity to potential mates, and how they may be involved in population divergence and speciation. Sometimes, even though two species are completely different, hybridization might occur. The white-throated sparrow looks nothing like the junco, and the two species produce completely different songs – and yet, they have been known to occasionally mate and produce hybrid offspring. How could they possibly make a mistake like that? We analyzed white-throated sparrow preen oil and found that white-throated sparrows and dark-eyed juncos share many of the same volatile compounds. Perhaps their odor is the reason for the inter-species allure. For more information about Danielle’s research, you can contact her at djwhitta at msu dot edu. For more about juncos, check out the Junco Media Project!